Dronfield television transmitter started broadcasting in 1984. It is a 3W (C/D group) horizontally polarised relay (or repeater) off Emley via Chesterfield. The latter is a 2kW repeater which is Vertically. 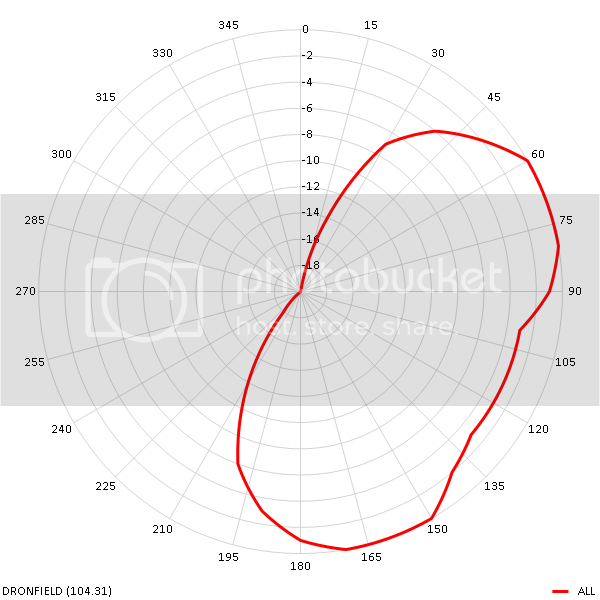 The fact that Dronfield is Horizontal is the opposite of usual practice for a repeater and the only reason I can think of for this is possible co-channel ? This use of differing polarities is to take advantage of “cross polar rejection” to minimise co-channel interference. Note that only the three basic PSB MUXES are transmitted from Dronfield, not all six. However, its 3 digital MUXES will be within its original C/D group. This particular mast is quite difficult to find as its in the grounds of a school, and is hidden from Falcon Rd (which runs behind it) by trees. Dronfield is probably the dividing point between The Midlands and The North. The difference in accents between Sheffield (just North of Dronfield) and Chesterfield (which is just South) is probably as big as anywhere else in the country over such a short distance. Close up of the Dronfield repeater`s array of receiving and transmitting aerials. Note the use of Log periodic aerials as sold and installed by ourselves. It is amplified and retransmitted from the top two Log antennas. Dronfield TV transmitter, hidden behind the bushes.